This coming year is, in my opinion, less about entirely new trends or just-revealed things-on-the-horizon, and rather is more about the extended manifestations of contemporary approaches to IT in general and infrastructure in particular. By "manifestations" I mean not only materialization and traction, but also acknowledgment and assimilation. OK, I won't allow myself to be attracted to write everything here. Instead, please watch this short video. You'll notice in the video that before I got to my particular selection of three significant market changes for 2018, I mentioned some of the technological and consumption changes that continue to dramatically impact the IT infrastructure world. 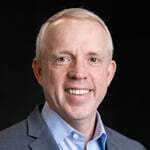 Terri McCLure has some thoughts and predictions around HCI that will be published soon; and Scott Sinclair recently posted his insights into storage in 2018. You can read his blog for more details, but I wanted to highlight one of his phrases because I think it's an underpinning to everything I mentioned in my video; he said that "if it isn’t automatic, it isn’t easy enough”...which I found a compellingly simple summary of where we are heading (or at least desiring to head!) in infrastructure overall. It is emphatically underlined by a research point from ESG's brand new 2018 IT Spending Intentions* research in which we found that 69% of senior IT decision makers believe their IT environment is more complex now than it was two years ago. No wonder things are changing; they have to. Thanks for watching the video and reading this. I will also be blogging in a bit more detail about each of the three predictions from the video over the early weeks of 2018, since I think their immediate simplicity can obfuscate their long-term significance. *If you are an ESG client and you would like to schedule a full read-out and discussion of this latest annual edition of our IT Spending Intentions Research, just let me know. It's that time again. As the year turns, we must all prepare plans, feasts, lists and, in this line of work, predictions. I'm seriously considering some time doing predictions in the summer because there's no reason a crystal ball should function better in December than in June. But hey, let's not break with tradition. With some trepidation, I started this year's process by looking back at what I said a year ago. It's with relief that I report that it was neither bad nor wrong. The old days of specific component progress have definitely been replaced by the contemporary days of overall system changes. I said that at the start of 2017 and I repeat it here with added emphasis for 2018. That's not to say that there is not still fascinating and compelling progress in particular infrastructure technologies. For example, the advances in flash storage, new non-volatile server memory, networking agility, and software analytics to match software definition are impressive and unrelenting. Equally, there are burgeoning new consumption models, whether HCI, cloud or, increasingly, cloud-like on-premises models that essentially work like flexible on-demand rentals. Everything I've mentioned will grow in importance and traction in 2018. But the action, the change of emphasis for 2018 and beyond is outside of the infrastructure itself. Instead, it's about the IT ecosystem of which infrastructure is, of course, a crucial component. So let's get to three infrastructure predictions for 2018. Number one, the march from IT as infrastructure technology to IT as information technology will continue. Decades of being attracted to and to be fair, gaining genuine value from bright, shiny objects will rapidly be replaced by a rightful focus on bright, shiny outcomes. Yeah. This is not the first time you've heard this assertion, but there's evidence that this is moving from marketing aspiration to manifest actuality. For example, the involvement of application owners in infrastructure decisions has grown significantly. The most successful infrastructure operations are those with the best integration and cooperation with their lines of business. The shift from IT specialists to generalists continues to grow. Whether it's always optimum or not, it's a fact and it's driven largely by the need to have IT focused on tweaking the business rather than tweaking knobs. And all the above is why the majority of ESG's areas of research interest for 2018 are about information technology generally and not infrastructure technologies specifically. Number two, hybrid IT is the norm for the foreseeable future. Again, this may not sound brand new, but the statement includes an important subtlety. No one, least of all me, is denying the tremendous impact, growth and value of the public cloud. But 2018 will be the year when it is genuinely okay to acknowledge that it's a two-way street. 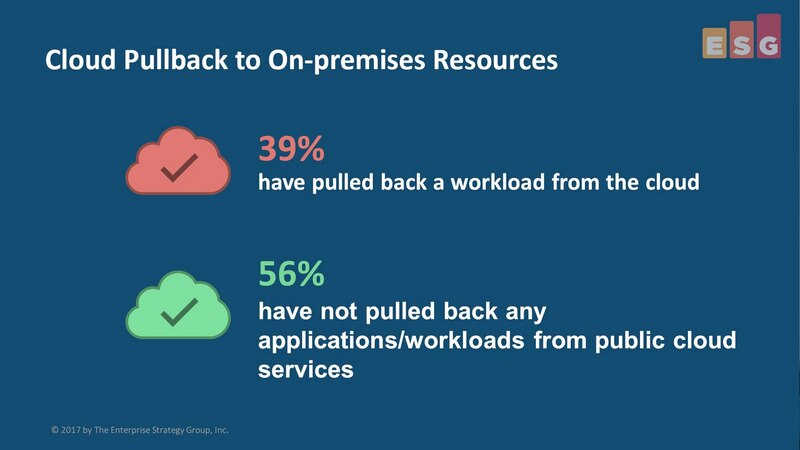 Our research already shows a significant percentage of end users have moved some workloads back from the public cloud. Now, obviously, they either always intended so to do or some commercial or SLA target was not met. Whatever it is, we're going to do more research to figure out what goes where and why. But in 2018, we'll all comfortably speak publicly about this bidirectional hybrid street. This generates a couple of important points. Two words, two functions really, will become increasingly prevalent through 2018. They are "orchestration" and "arbitrage." That's not just the ability to manage what goes where in a seamless manner, but also to accurately figure the optimum placement for everything by platform, by place and dynamically. We'll also agree that hybrid does not mean having some of each. Having an electric car and a gas guzzler in your garage doesn't mean you have two hybrids. What matters is having flexible access to switchable, dynamically optimizable resources. This will drive tools that are represented by the phrase "data platform." Expect to see more of such semantics, along with composable fabrics and so on in 2018. So to number three. It's quicker and easier than the first two. But the sum of those others, a renewed focus on information technology outcomes and the use of sophisticated hybrid data platforms means that the power and value of major IT brands will trend upwards in 2018. Those two things both drive and also benefit from a mature IT infrastructure industry that breeds consolidation. Brand affiliation and stickiness is, I think, bound to increase. Interesting times, indeed. IT infrastructure has never been more important but equally has never been desired to be more invisible. The current markets and technology states mean that increasingly, we don't have to choose between the two. Thanks for watching.